The ring was perfect. The quality was top notch and I'm delighted with the purchase. I purchased thus ring for my son. He had described what type of a ring he wanted. When I checked out your website I knew straight away that this ring was perfect. 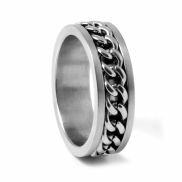 Here you will find our entire collection of men's steel rings. These rings are made from 316L stainless steel also known as surgical steel. This is the highest quality you can find in stainless steel. 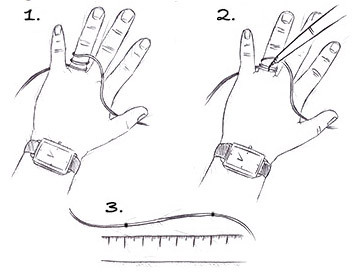 You will find our handy measuring guide on each product page that will help you determine your ideal ring size. Stainless steel is made of a mixture of iron, carbon and chromium the latter metal gives stainless steel its shine and resistance to corrosion. Stainless steel is made in many different mixtures but the best for producing fine jewellery is 316L stainless steel, also called surgical steel. All Trendhim steel rings are made with 100% surgical steel. 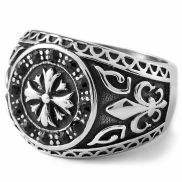 Rings made of stainless steel are relatively inexpensive, stay beautiful and shiny for many years. 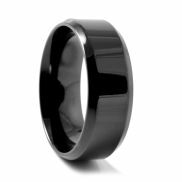 They are hard as well as durable and generally are a great choice in men's rings..
All of our steel rings are tested as to nickel content and if the % is small enough they can be said to be nickel free. The truth is that all steel contains some nickel even in minute quantities. So if you are allergic to nickel or you have very sensitive skin, we recommend that you look at titanium rings instead of steel. After many years of usage, a steel ring can lose some of its gloss in the same manner as silver and gold rings lose their shine. Fortunately, steel rings can be polished back to their original brightness. Stainless steel is a poor conductor of electricity, that for some can be an advantage..
A steel ring is very tough and not easy to scratch, but not as hard as say a titanium ring. Stainless steel is resistant to rust, thus the name. This does not mean that it cannot rust and is therefore recommended that you do not bathe in salt water with your steel ring on. 1. Start with a thin piece of string around the finger where the ring must be seated, light coloured sewing thread works well. 2. Use a pen to draw a straight line over the string. 3. The distance between the two dots is the perimeter. Next use the choose size menu to get circumference and diameter for ordering.